In savanna environments, fire and grass are inextricably linked by feedback loops. 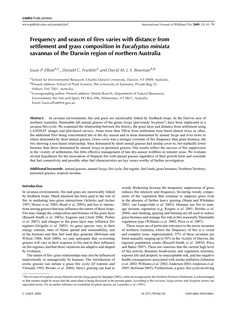 In the Darwin area of northern Australia, flammable tall annual grasses of the genus Sarga (previously Sorghum1) have been implicated in a savanna fire-cycle.We examined the relationship between fire history, the grass layer and distance from settlement using LANDSAT images and plot-based surveys. Areas more than 500m from settlement were burnt almost twice as often, the additional fires being concentrated late in the dry season and in areas dominated by annual Sarga and even more so where dominated by short annual grasses. Grass cover was a stronger correlate of fire frequency than grass biomass, the two showing a non-linear relationship. Sites dominated by short annual grasses had similar cover to, but markedly lower biomass than those dominated by annual Sarga or perennial grasses. Our results reflect the success of fire suppression in the vicinity of settlements, but little effective management of late dry-season wildfires in remoter areas. We evaluate several hypotheses for the association of frequent fire with annual grasses regardless of their growth form and conclude that fuel connectivity and possibly other fuel characteristics are key issues worthy of further investigation. annual grasses, annual Sarga, fire cycle, fire regime, fuel loads, grass biomass, NorthernTerritory, perennial grasses, tropical savanna.